Deciding who your wedding supplier will be is a hard task especially with a lot of choices that are now available. From church, venue, catering to event emcee, wedding suppliers have found a way to offer different product and services that could give you headache sometimes (or most of the time). You can also further minimize the options by investing in the five key suppliers that plays an essential role of every wedding. Each could turn your wedding from ordinary to extraordinary given the right choice you and your future better-half will make. 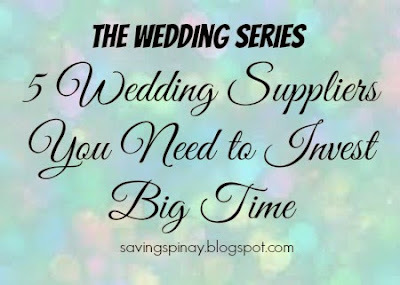 Take note that this list of 5 Wedding Suppliers You Need to Invest Big Time is arranged in no particular order. Investing in a great venue is a good investment for this is where the memories will take place. Few years from now you will get back at that venue and you will start reminiscing your wedding. You don’t want to see unpleasant area, right?! Make sure that you pick a place that matches your theme and look for a venue that offers a competitive price with freebies. You can never let your guests have empty stomach on your wedding day.Let them feel their importance by providing quality food and service by your catering supplier. Decide what time of the day your event will took place so that the food selection can adjust. The theme of the event will also be a big factor in deciding the menu of the event.It is important to choose a catering service that offers the best food package. Do not be thrifty for food for it is a key element for every wedding. A wedding happens once in a lifetime and capturing the moments should be capitalized.You can never go wrong with hiring a professional photo and video team as everything in your wedding day is spontaneous. You need someone with a sharp eye with knowledge on what angles to shoot. Hiring a professional emcee is very important as the flow of your reception highly depends on the host of your choice. You don’t want your wedding to be listed in the Top 10 Boring Weddings List, right? If you want a wedding that your guests will remember for a lifetime,opt for a professional one than asking for just somebody close to you who have lesser experience in this field. This may seem not needed but hiring wedding planner/coordinator will save you a lot of effort, energy and money on your wedding day. Find someone that again has experience, capability and reasonable price then go for it. They can help you a lot in wedding decisions and will give you a lot of insight from choosing a venue to other wedding suppliers. It’s better to invest in something that is important in your wedding day. This doesn’t mean that other wedding suppliers should be forgotten. The main thing is you set priorities based on your wedding budget. Investing in these 5 Wedding Supplier can only serve as a help in your planning and preparation. To help you filter the overflowing list of potential wedding suppliers make sure you have the right preparation first. Preparing plays a big key for you need time to research and to canvass for the exact wedding supplier for your event’s need. Give at least six months to one and half years for the preparation period wherein the research and canvass is done on or before the first month is gone.